^ "University of Waterloo Financial Statements" (PDF). University of Waterloo. 2017-04-30. Retrieved 2017-12-31. ^ a b "Waterloo Facts". Retrieved 2018-05-03. ^ General, The Office of the Secretary to the Governor. "University of Waterloo [Civil Institution]". reg.gg.ca. Retrieved 2017-10-11. ^ "SLC/PAC Expansion Project | Associate Provost, Students". Associate Provost, Students. 2015-12-14. Retrieved 2017-10-11. ^ "BlackBerry stock rises 16% despite $4.4B loss". CBC News. 20 December 2013. Retrieved 2013-12-20. ^ "University of Waterloo buys BlackBerry buildings, land for $41 million". Toronto Star. 20 December 2013. Retrieved 2013-12-20. 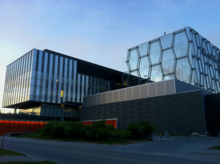 ^ "Waterloo ranks 13 in global University Impact Rankings 2019". University of Waterloo. April 3, 2019. Retrieved 16 April 2019. ^ "UW to open AI research institute | CBC News". CBC. Retrieved 2018-04-12. ^ "Section B (Common University Data Ontario 2015)". Institutional Analysis & Planning. 2016-03-18. Retrieved 2017-01-02. ^ "About Co-operative Education". Retrieved 2015-09-25. ^ "Working abroad". Retrieved 2015-09-25. ^ "Heather Moyse | Kinesiology". Kinesiology. 2012-08-29. Retrieved 2017-10-11. ^ "Moyse switches from bobsleigh to track cycling". CBC Sports. Retrieved 2017-10-11. ^ "English alum Rupi Kaur makes top seller lists with poetry collection | Arts". Arts. 2016-02-10. Retrieved 2017-10-11. ^ Publishing, Andrews McMeel. "Sales of #1 New York Times Best Seller Milk and Honey by Rupi Kaur Reach One Million Copies". www.prnewswire.com. Retrieved 2017-10-11.